Owned by the Vauthier family of Ch. Ausone fame, this is just as jaw-dropping, in its own way, as its illustrious sibling. This is a proper St Emilion with the Ausone panache shining through. Made from 80% Merlot and 20% Cabernet Franc, it has a dark inky colour with a delicious Port-like nose of intense, rich, dark fruit. This is a sensuous wine with sweet, creamy forest fruits and earthy, floral and chocolate overtones. The tannins are big and ripe, completelely subsumed within the enormous fruit and long finish. Production is very limited here, with only 3000 cases made. Unmissable. 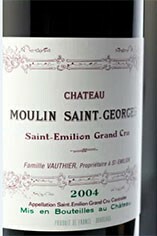 The Wine Advocate - One of the strongest efforts I have ever tasted from Alain Vauthier, his small St.-Emilion estate, Moulin Saint-Georges, has turned in a gorgeous 2005 with an opaque purple color and a sweet nose of blueberry and black raspberry fruit along with spring flowers. Rich, full-bodied, and still moderately tannic, this is a wonderful sleeper of the vintage and a wine capable of further evolution for at least another 10-15+ years. Jancis - Very very dark, like its stablemate Fonbel (and Ausone of course). Very rich and opulent on the nose. Extremely intense. Like a scrubbing brush on the palate, it´s so concentrated. Lots of acidity and long but needs time. Wine Spectator - Deep, dark ruby in color. Superconcentrated aromas of crushed blackberry, black licorice, espresso and leather follow through to a full body, with ultrafine tannins and loads of coffee and fruit flavors. Very long. Best after 2016. 2,500 cases made. Parker - The second most well-known estate of perfectionist proprietor Alain Vauthier (the best-known is Ausone), the inky/purple-tinged 2005 Moulin-St.-Georges offers sumptuously sweet aromas of candied cassis, crushed rocks, flowers, and incense. 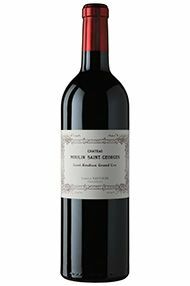 Intense, full-bodied, and deep, with fabulous purity, texture, and freshness as well as a 40+ second finish, this may be the finest Moulin-St.-Georges Vauthier has yet produced. Château Moulin St Georges has been referred to as a junior version of Château Ausone as it is owned by the same proprietors, the Vauthier family. Its 17.3 acres of vineyards are located between those of Ausone and La Gaffelière and are well-sited on a south-west facing slope, known as the Pavie slope. The vineyards are planted with Merlot (66%), the rest (34%) Cabernet Franc and Cabernet Sauvignon. The vines are expertly cultivated by Vauthier who firmly believes that a wine's quality is first and foremost a function of the vines and the fruit they bear. Consequently, yields are kept deliberately low and the grapes exclusively hand-harvested. Winemaking takes place in temperature-controlled, stainless steel tanks and the wine is then matured in 100% new oak barriques for 15-20 months. The wines are bottled unfiltered.